By Fr. David Meconi, S.J. 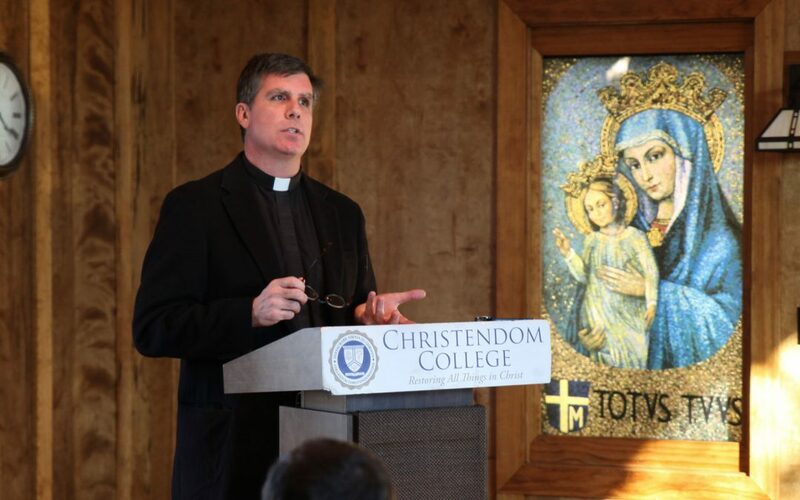 Thomistic scholar and author Reverend David Meconi, S.J., delivered Christendom College’s annual St. Thomas Aquinas Lecture on Wednesday, January 28, 2015. Fr. Meconi teaches in the Department of Theological Studies at Saint Louis University, and is the editor of Homiletic and Pastoral Review. Most recently he published the Annotated Confessions of Saint Augustine (Ignatius Press, 2012) and The One Christ: St. Augustine’s Theology of Deification (Catholic University of America Press, 2013); he has co-edited (along with Eleonore Stump) the Cambridge Companion to Augustine (2014); he is currently editing and translating the Patristic and Medieval Commentaries on the Psalms for Eerdman Press’ The Church’s Bible Series. Fr. Meconi is a former president of the Jesuit Philosophical Association, as well as a Fellow at the Augustinian Institute at Villanova University, and serves on the ecclesiastical board of Boston College’s School of Theology and Ministry, as well as the Saint Benedict Institute at Hope College in Holland, MI.